Hydraulic and Pneumatic Seals are moulded according to working temperature, cylinder speed, cylinder operating pressure, working application, and medium. They are usually non-metallic, quite soft rings placed in a housing, or arranged in a mixture of rings creating a sealing unit. This is to separate or block liquid in applications that involve reciprocating motion. Hydraulic seals are crucial in machinery equipment. Their use is vital when it comes to enabling the transformation of liquid into linear motion. 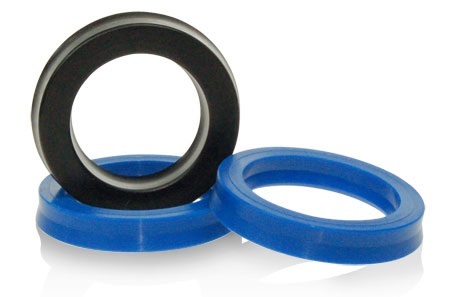 Hydraulic Seals are generally made out of a variety of materials, including Rubber, PTFE, and Polyurethane (AU). Compatibility of the materials is decided upon the particular operating medium or restraints due to pressure, fluid type, temperature or chemical compatibility. Static Hydraulic Seals are positioned in a housing where there is no motion involved, they are sealing only within their limited space. Dynamic Hydraulic Seals are Rod Seals and Piston Seals. Rod Seals are exposed to the motion on their inner diameter along the rod or shaft of a hydraulic cylinder. However, Piston Seals are exposed to the motion on their outer diameter along the bore or tube of a hydraulic cylinder. Piston Seals guarantee liquid or other media do not pass round the piston due to the system pressure pushing the piston down the cylinder amid a stress course. They are generally single-acting seals, which means the stress acts only on one side; and double-acting seals, which means the stress acts on both sides. Rod Seals are deliberated to be the most substantial component of a cylinder sealing configuration. As the rod rotates back and forth, they avert the leakage of the liquid from inside of a hydraulic cylinder to the outside (dynamic stress sealing). Therefore, Rod Seals function in conjunction with Wiper Seals to guard a hydraulic configuration against outer contaminants including dust, dirt and outside atmospheric circumstances. 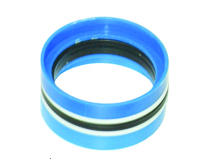 Wiper Seals (also called Scraper Seals) generally are used together with other sealing components. They generate a tight fit whilst still permitting a reciprocating rod to travel via the inner seal bore. Wear Rings are used to retain the piston centralised. This grants for equal and even wear, and stress allotment on the seals. Rod and piston installations use Wear Rings. Our Hydraulic & Pneumatic range allows a full scope of operating cycles. General applications include cylinders, forming machines, hydraulic presses, and movable cylinders. 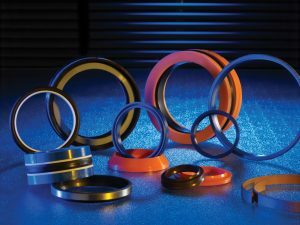 We supply Hydraulic & Pneumatic seals for single and double acting cylinders, composite piston seals, compact seals, independent wear rings, bonded seals, static seals (O Rings), and symmetrical seals. Manufactured properties include Ultra-low friction, wide temperature range, water resistance, and ultra-long life. If you require additional information about our range, download our catalogue or contact a member of the team.